Border control agents pulled over a tractor-trailer on Highway 83 near Laredo, Texas when they found more than 75 undocumented immigrants stuffed inside the box-like enclosure, officials said. According to US Customs and Border Control, the driver was pulled over and questioned about his immigration status, . 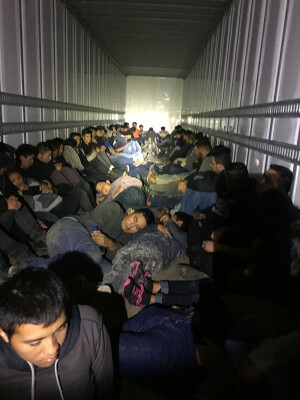 The truck was subjected to a secondary inspection when the agents inspected the inside, they found 76 immigrants from Mexico, Honduras, El Salvador and Guatemala. Thirteen of the immigrants were children unaccompanied by adults. Border officials blamed the disturbing incident on criminal trafficking. “These criminal organizations view these individuals as mere commodities without regard for their safety,” said Laredo Sector Assistant Chief Patrol Agent Gabriel Acosta. The driver who is a US citizen was arrested, and the immigrants were taken to safety.